Children will spend time studying core units such as the Greeks; the Roman Empire and its impact on Britain; Shang Dynasty in China; changes in Britain from Stone Age to the Iron Age; Britain’s settlement by Anglo-Saxons and Scots; the Vikings; early Islamic civilization and significant key figures and turning points in British History. Children will also explore supplementary units including Local Studies. 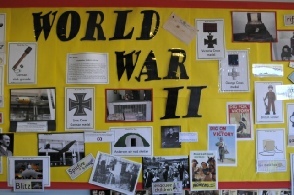 Children in Year 4 go on a residential trip to Lincolnsfield to immerse themselves in World War II experience to develop new skills and knowledge in history.